This is a warning. I’m not in a good mood. And no, it has nothing to do with politics, the upcoming ‘big football game’ or even January which I’m sure has lingered longer than it’s allowed by law. Nope, I’m ticked off at people who talk about cooking ‘cheats’ – short cuts to make cooking 1) faster, 2) easier, or just 3) better. Folks, this isn’t cheating. Cheating was when you copied answers from another kid’s history test in 5th grade. (Cheated was how you felt when you still got a C.) It’s not cooking. Because bottom line, if it tastes good when you tuck in, then it’s good cooking. Cascabel chiles get their name from the rattling sound they make. We’ve got enough guilt floating around in the world as it is. If I needed more, I’d call my Mother. So this recipe isn’t a cheat, it’s just tasty. Normally, at Chile HQ, we’d sweat the onions, then add in the celery and carrots – taking our time to extract every morsel of sweet loveliness. But here, we’re letting the slow cooker do the work for us. A lot of time makes this a super rich dish but all you have to do is a bit of chopping, and you can do that, can’t you? 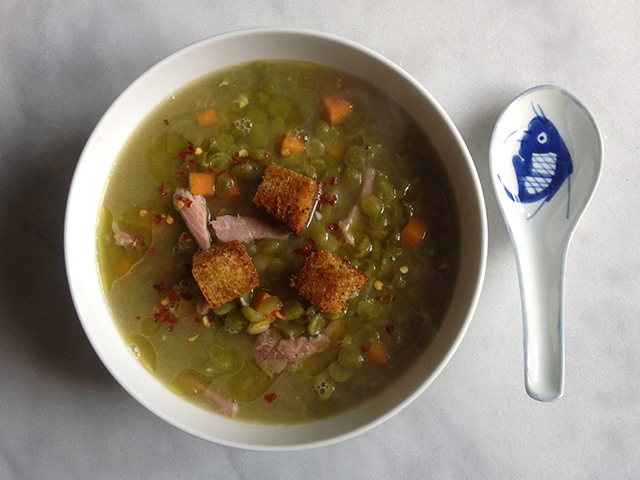 This is a January soup and if you’re clever you’ll freeze the leftovers and have it in February. Because let’s be honest, February may be short but it sure feels long. Place the lentils, celery, carrots and onion in the slow cooker. Pour in the stock, add the cascabel chile and chipotle chile powder. Cover and cook on low for 5-6 hours, until the lentils are almost cooked. Add the ham and the canned tomatoes, taste and add more chipotle chile powder and salt, if needed. Cook for another hour and serve warm. Note: Don’t worry about removing the casabel from the finished dish– it will have lovingly melted into the soup. Is there too much of a good thing? Before you answer ‘yes’, let me introduce you to the ham I made on New Year’s Day. It went down a treat the first day – studded with cloves and brown sugar, it was a dream way to start the New Year. Subsequent days brought a succession of ham leftovers to the table. At first everyone put on a brave face but by day 3 there was dissent within the ranks – threats of a kitchen coup d’etat and lots of eye rolling and mutterings. And the darnedest thing? I swear that puppy regenerated every night. I’d wrap the ham up, pop it up in the fridge and the next day I’d pull it out and it looked as big as when it first came out the oven. No matter how much we ate, there was always more. It started to feel like an Edgar Allan Poe story (The Tell Tale Ham?) or an episode from X-Files. Finally, it was time to take drastic action. 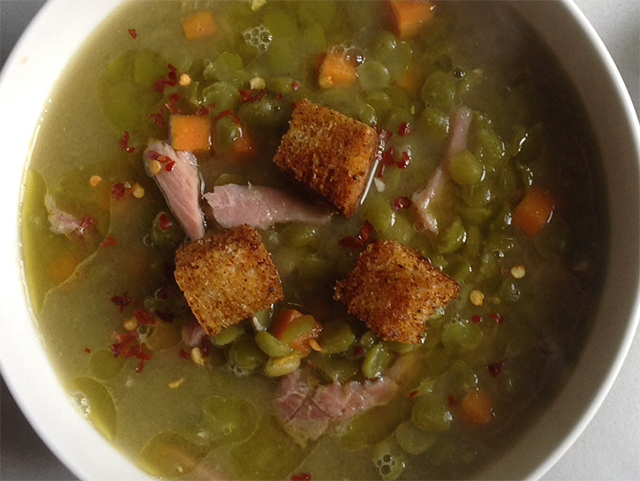 Knife in hand, I sliced and diced and made a massive pot of Chile Spiked Split Pea & Ham (natch) Soup. I made it with ham broth from when I first cooked Mr. Ham but water would do well too. The recipe is pretty standard – how can you improve on a classic? 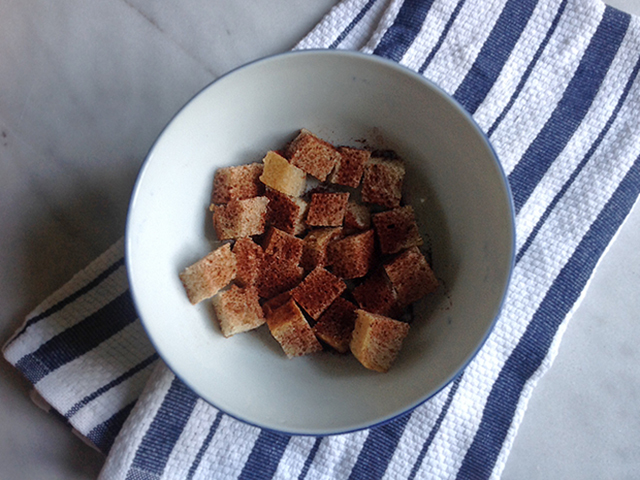 But never content to let well enough alone, I jazzed the soup up with some chile and then topped it with chile croutons. 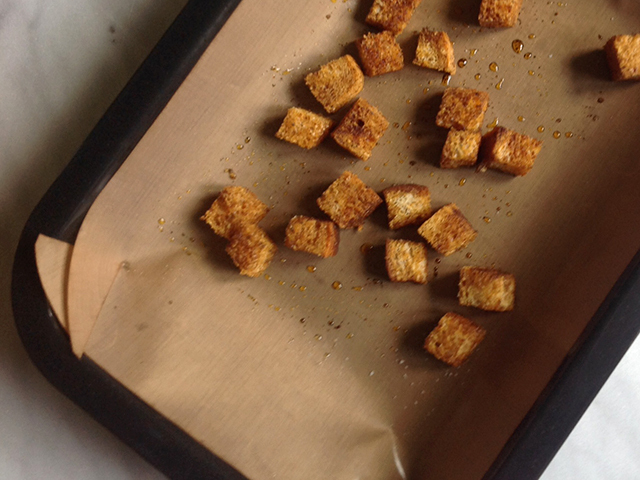 Croutons sound so classy when let’s be honest – it’s only fried bread. But fried bread is a good thing. 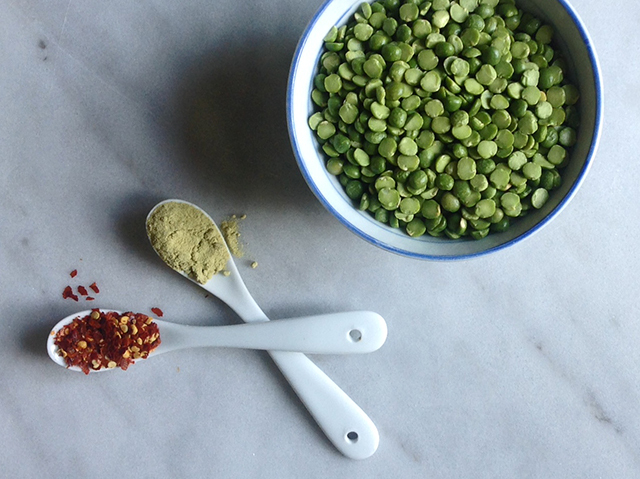 This make a healthy pot of soup – put the leftovers in plastic containers and pop in the freezer for a rainy/snowy day. Just don’t blame me if you find the containers breeding in your freezer. Ham has a way of doing that.